Have Weather Tight help you get the home you’ve always dreamed of with a new metal roof. Metal roofing is a versatile, lightweight material that’s built to last and designed to protect your home. It is 100 percent recyclable and good for the environment, reduces household energy consumption, and provides a high-end look in the style of your choice without spending a fortune. Metal roofing can last up to four times longer than traditional asphalt shingle roofing. Organic materials like asphalt shingles and wooden shakes start to deteriorate as soon as they are exposed to the weather. But our metal roofing’s superior resistance stands up to the harshest weather conditions—like hail, heavy snow, strong winds, and 130 mph winds. Its incredible resistance paired with a full manufacturer warranty means your home will be sound and secure for years to come. And because our metal roofing protects your home so well, it can even lower the cost of your homeowner’s insurance. Shake—captures the look of wooden shake roofs by replicating the natural coloring and irregularities of real wood. Slate—replicates the look of slate with irregularities like chiseling and cracks found in stone. Tile—comes in eight traditional and contemporary colors to give you the interest and character of tile. 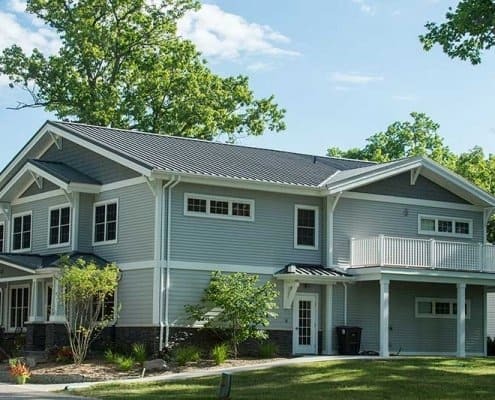 Standing seam—showcases the look of a traditional metal roof that is both practical and updated, and comes in 33 different colors. To learn more about color options based on the style of roof you want, consult our chart below. You can read about ice dams, roof ventilation, and the warranty that comes along with your new installation. Our customers know that Weather Tight is the best choice for home remodeling services—not just because we’re affordable, but because our service is exceptional. We’ve helped over 25,000 happy customers and now it’s your turn. Call today for your free in-home, no-obligation consultation. Our metal roofing is not only beautiful, it leads the roofing industry for hail and fire ratings. In climates with extreme weather conditions such as wildfires, snow load, ice dams and wind storms, a solid, weather-resistant roof is a top priority. 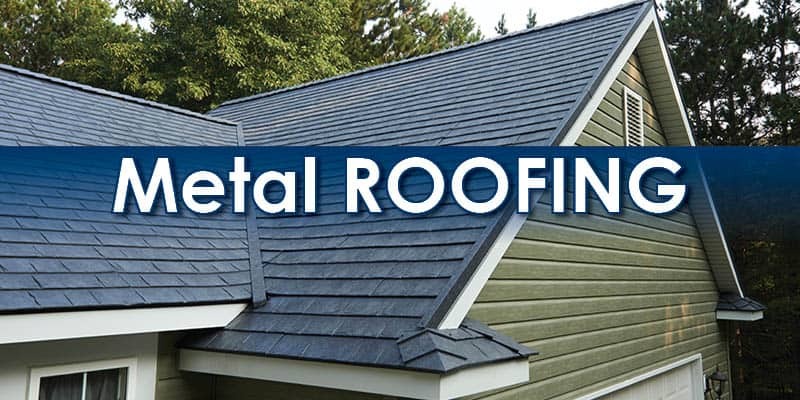 The strength and practical aspects of metal roofing make it a responsible roofing material choice for any homeowner. A 130-mile-per-hour wind rating means a metal roof is always ready for a strong wind storm. 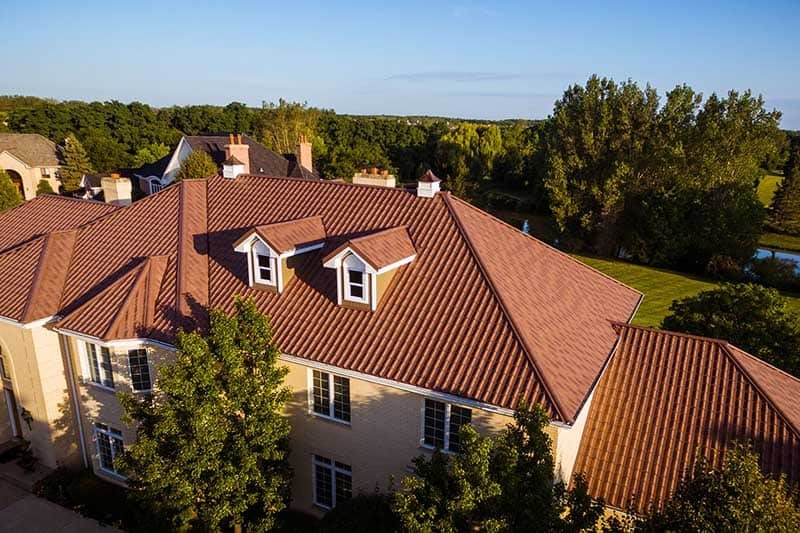 As a fire and damage resistant roofing surface, installation of a metal roof also offers the potential of reduced homeowners insurance costs for the home. The strength and durability of modern metal roofing means it can last up to four times longer than a traditional asphalt shingle roof. Because they are organic materials, asphalt shingles and wooden shakes begin to deteriorate as soon as they are exposed to the weather. Tile, shake and concrete roofs can crack or warp, especially when exposed to freeze-thaw cycles in four-season climates. Metal roofing eliminates these risks and lasts for many years without signs of wear or failure. Four Distinct Styles to give your home a great look. 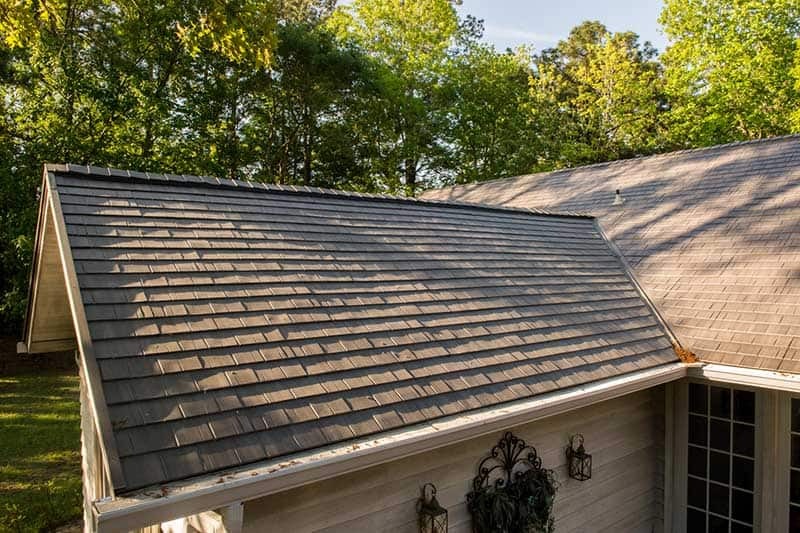 Our shake roofing shingle styles capture the look of a wooden shake roof. We offer many metal roofing styles that replicate both the natural colors and irregularities of real wood without the maintenance needs and risk of fire. 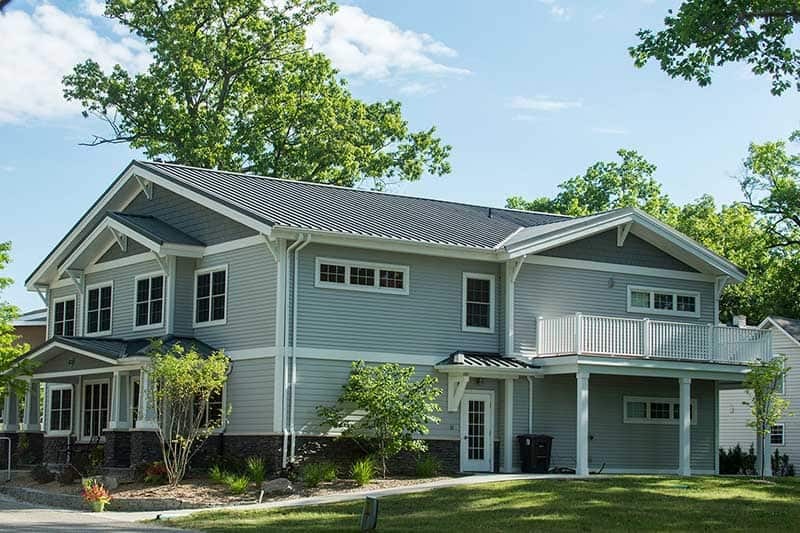 Shadow lines, elevation changes, and other natural features of wood are replicated in our long-lasting metal roofing with a high wind rating and chiseled troughs to allow consistent water flow away from the roof. Choose the “Color Options” tab to the left to see the style and colors. 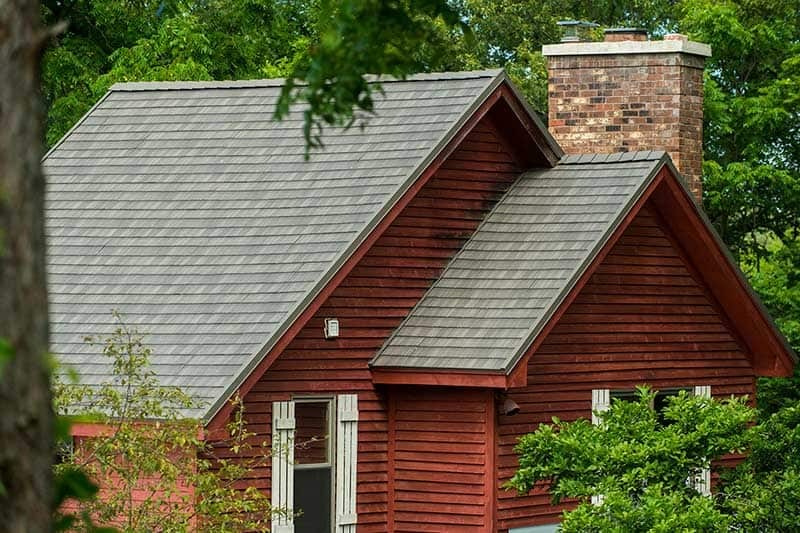 As with our shake roofing style, metal roofing can also capture the look of natural slate. 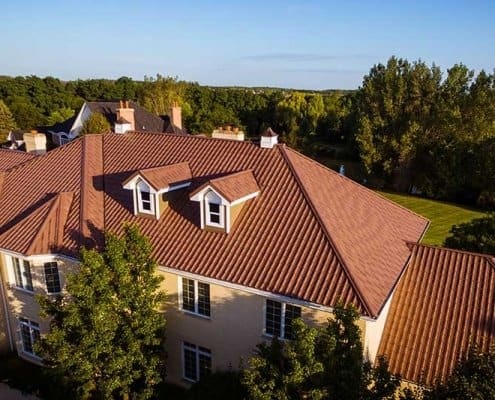 The irregularities of stone, chiseling and cracks are all incorporated into the metal roofing design to provide a beautiful roof without the heavy weight of slate. 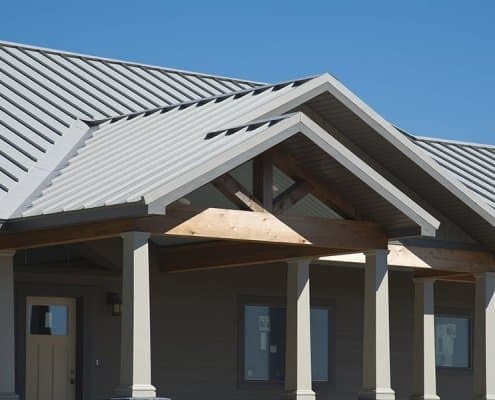 A high wind rating, elevation changes and chiseled troughs add to the functionality and practical applications for this metal roofing material. A variety of five different natural colors are offered, which can be seen by clicking on the “Color Options” tab to the left. The tile roofing style replicates the character and interest of tile without adding a large amount of extra weight to the roof. It is attached with a tongue and groove fit. With eight beautiful colors in both traditional and contemporary hues, our tile metal roofing will compliment many home designs and tastes. Click on the “Color Options” tab to the left to see the variety of color choices. 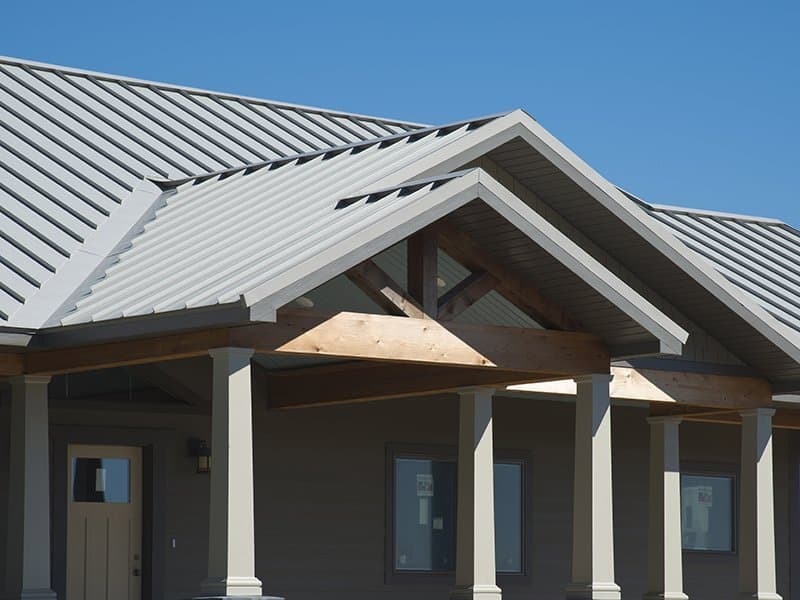 This traditional metal roofing look is both practical and updated for modern use. The Horizon-Loc panels are 26 gauge thickness and feature a hidden fastener design which prevents leaks. 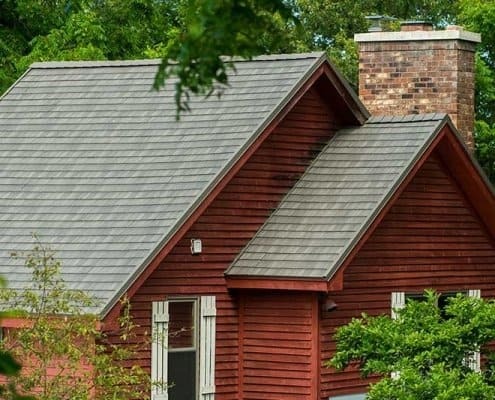 The roofing comes in 33 different color options and offers an optional texture that mimics the texture of traditional shingles, adds a depth of color, and adds durability. As an environmentally friendly roofing product, the longevity of our metal roofing reduces the possibility of landfill waste. Because metal roofing is 100% recyclable, there is no reason for any of this quality roofing material to become waste. Metal roofing is available in Energy Star® rated colors to reduce energy consumption as well. These roofing colors can reflect up to 65% of solar radiation to keep a home cool in the summer. The energy savings provides the benefit of lower utility bills as well. Weather Tight metal roofing is also recommended for rainwater harvesting, as it is one of the best roofing systems for ensuring safe water that is free from environmental pollutants. Due to waterproofing chemicals, rainwater runoff from asphalt or wooden shake roofing can contain lead and mercury which could make it unsafe for use in the home or garden. 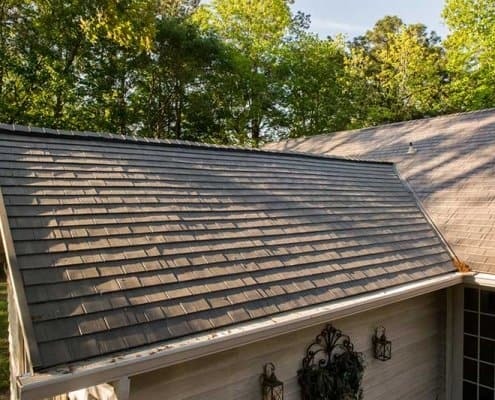 Additionally, rainwater runoff that flows into our sewer systems, water aquifers and rivers will have less chance of carrying pollutants when it has come from a metal roof rather than an asphalt shingle roof. Rainwater from metal roofing also contains lower levels of harmful bacteria and dissolved organic carbon. Tired of icicles surrounding your home all winter long? Noticed water damage in your attic, or worse yet, the interior walls of your home? Ice dams may be your problem. Worried how it affects the efficiency of your shingles? So many of the issues associated with ice dams can be cured by the proper installation of a new roof, and the accessories and proper ventilation it needs to outlive the long Wisconsin winters. An ice dam is a layer of ice that is built up at the edge of the roof that prevents melting snow from draining off of the roof. An ice dam can occur when a cycle of repeated freezing and thawing causes ice to build up on the roof, blocking the path of newly melted snow as it travels toward the gutters. Snow accumulates on the slanted roof of a house and warmth coming up through the roof melts the snow from underneath. If the snow is thick enough, melt water flows down the roof, beneath the blanket of un-melted snow, until it flows onto the eave and into the gutter, where colder conditions on the overhang cause it to freeze. Eventually, ice accumulates along the eave and in the gutter, “damming” up the path of the newly melting snow. The next batch of melted snow now cannot drain properly, and water continues to build up and eventually backs up underneath your shingles where it can cause major leaks. Can Ice Dams Be Completely Prevented? Under extreme conditions, with heavy snow and severe cold, almost any house can have an ice dam, whereas a house that is poorly insulated and ventilated will have ice dams even during normal winter weather. While many of us have taken steps to reduce the ice dams that can occur during Wisconsin winters, preventing ice dams in extreme weather, as we’ve experienced recently, requires a few additional measures on the part of the homeowner. How Can I Minimized The Chance Of Having An Ice Dam? Keep the roof cold by keeping the attic cold. Install more insulation in the attic floor. Seal bypasses into the attic. Draw more outside air into attic through gable and eave vents. Install slippery metal roofing along the eaves so that snow and ice slide off more easily. Before installing new shingles, install an adhesive, waterproof, rubberized ice-shield membrane on the sheathing to seal around nail holes and protect the sheathing from backed-up water. Switch to a warm-attic system. Make your attic part of the conditioned space of your house. This requires that you insulate the attic roof from both sides, insulate the exterior walls of the attic, and install energy-efficient attic windows. Install electric roof de-icing cables to create a heated drain path that allows melt water to drain off the roof through the gutter and downspout system. Roof de-icing cables should be installed by an electrical contractor per the national electric code on a dedicated GFCI protected circuit. 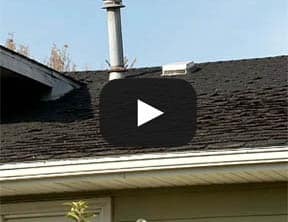 What Maintenance Does My Roof Need In Winder? Make sure attic vents aren’t blocked. Remove excess snow with a roof rake. 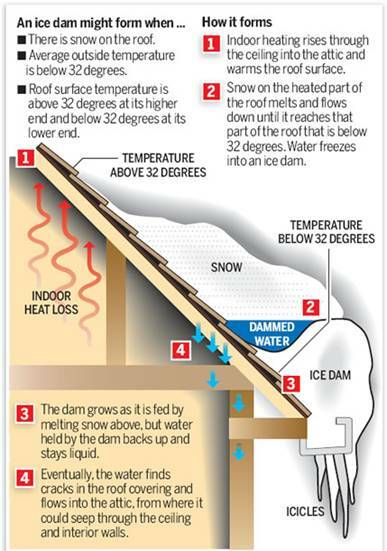 Break up ice dams by creating ice channels to drain water. Address snow build-up early, before it has a chance to melt. Hire a company to steam the roof if other measures cannot control the ice buildup. Do not chop ice off the shingles. You will damage the shingles. Do not use a blowtorch. You could burn your house down. Do not throw anything on the roof that cannot be retrieved. This can cause rain gutter plugging. Do not take your gutters off your home! The water will not back up without gutters, but will instead drop down to the ground and into your foundation. 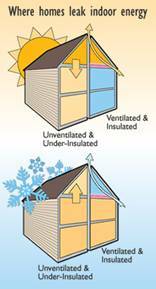 Proper roof ventilation and a properly insulated attic help keep your home energy efficient. To understand why they both work together, we must first understand why a home may be inefficient when it comes to the amount of energy it uses. Your WE Energies bill can tell you a lot about how efficient your home is. Talk to your neighbors and friends and see if your energy bills are higher than theirs. How do your homes compare? The heating/cooling elements of your home only turn on and run when the temperature of the home is not equal to the display on the thermostat. The more often the furnace or air conditioner has to run, the higher your energy bill becomes. When your home is fully insulated and properly ventilated, the energy bill is at a minimal level. So, if you are writing big checks to WE Energies, and are tired of doing so, it is time to make improvements to your home. Another tell tale sign that your attic needs more insulation or your roof needs to be better ventilated is the temperature in your home. Is the second story of your home warmer than the first? This is caused by the sun beating down on the roof all day long. Without proper ventilation and insulation, the warmth from the sun enters your home and battles with your heating and cooling system, ultimately winning the battle of the second floor. Your first floor may seem colder than your thermostat reads, or the second floor may seem like a boiler room. The reverse happens in the winter months, when snow covers the roof and makes the attic colder than the rest of the home. Taking measures to properly insulate your attic and vent your roof can significantly reduce the temperature difference between the first and second floors of your home. When the roof is properly ventilated, it allows air to flow naturally into the attic, and back out again. It also prevents excess heat and moisture to accumulate in the attic, which would lead to the need for a new roof earlier than planned if contained in the attic for extended periods of time. Having a properly ventilated roof allows your home to breathe. When the excessive temperatures are released from the home instead of into the living areas of your home, it keeps the temperature of the home at a stable level throughout the house. This reduces the need for your heating/cooling system to be used, in turn reducing the energy your home needs to function. A ventilated roof will also help keep rotting and warping of siding as well as mildew, drywall damage, and peeling paint both inside and out. It also keeps moisture from being trapped in structural wood, insulation, and shingles. Owens Corning ventilation products allow you to have proper ventilation of your roof in a low-profile design. Vents are added to the ridges of the roof and Hip and Ridge Shingles are then placed on top of the vents. This helps to protect the vents and allows them to do their job all while giving your roof a beautiful, finished look. Quality Edge, Inc. warrants that its Matterhorn® painted metal roof products (the “Product”) (a) will be free from manufacturing defects if used as intended (b) will not peel, flake, chip, or crack, (c) will resist deterioration or penetration of steel substrate from hail up to and including class 4 hail (as defined by the National Weather Service), (d) will resist wind and uplift damage for winds up to 130 miles per hour, and (e) after removal of foreign surface deposits, will not chalk more than eight (8) Hunter ΔE units, and will not fade under normal weathering more than five (5) Hunter ΔE units (together the “Matterhorn® Warranty”). Color difference units are determined by ASTM D2244. Chalk erosion ratings are determined by standard methods for evaluating chalking under ASTM D4214 method A. Is there a charge for the consultation? No. There is no charge. How can we see samples of your product? Weather Tight offers free, no obligation estimates in which experts can stop out, take measurements, and show you working samples and color swatches. They will also provide you with written warranties for your examination as well as a price quote. Otherwise, you can visit our Idea Center where customers may stop in to see working samples (114th & Oklahoma). 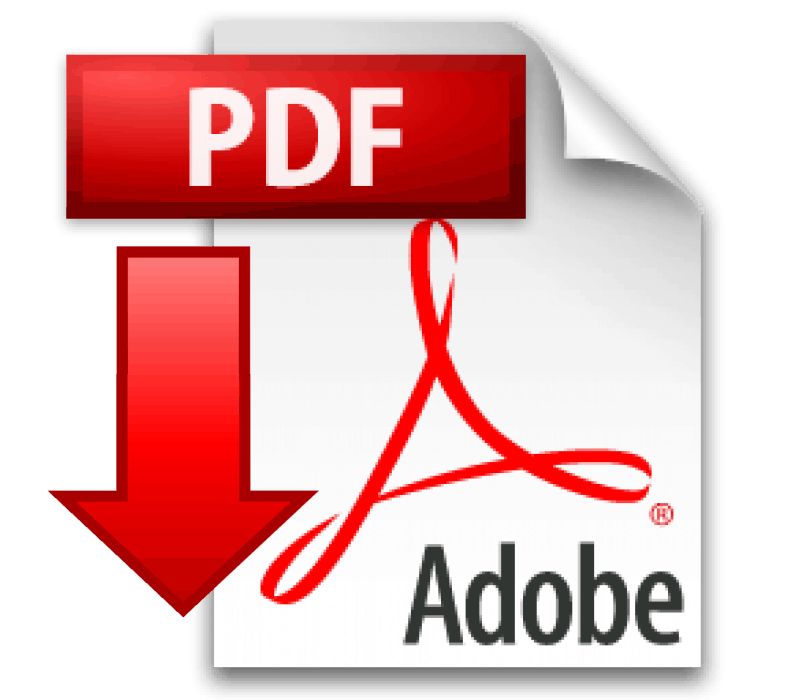 How can I receive a written quote? Since our products are custom made to order for YOUR home, we recommend that you set up a free in home consultation. The expert will take precise measurements and provide you an accurate quotation, guaranteed for one year. Who will need to participate in the estimate process? All homeowners need to be present for the consultation. We also suggest that you invite anyone whose input you value, such as a friend, relative, or significant other. If I am having an issue with my current product, what do I do? Contact us immediately. We will be more than happy to help as best as we can. You can contact us at 414-459-3896. To expedite your call, please have your phone number, name, address, and a brief description of the issue available. Don’t have time to call? You can send us an email at service@weathertightcorp.com. One of our representatives will contact you back via email (or phone) to assist you.